Well-deserved praise for the bookseller. I don't mind the high-flown style. Praise also for the actual feel of books. I am reading E.M. Forster's "Collected Tales" and enjoying the feel of the book, published in 1947. At five by seven inches, it fits in my hand. The weave of the blue cloth cover is palpable; the paper, slightly yellow, thick, matt; the jaunty chapter-head decorations are by W.A. Dwiggins. (I'm going to look him up.) It's a pleasure to thumb the dry, matt deckle edge. W.A. Dwiggens! It turns out he also designed the Forster book as well as the chapter-head decorations. He was the eminent book designer. Will book design matter, if Kindle replaces actual books? I will have to keep my eyes open for this book. I know I would love it. Thanks for the post! didn't Uden mean books when he listed "elixir of life" rather than an under the counter tipple? Author and book completely new to me, thanks Nigel. 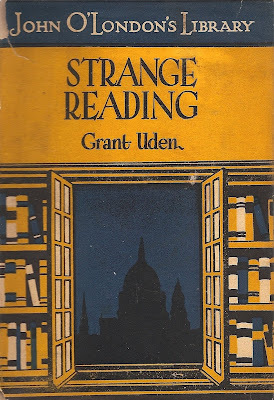 I like Mr Uden's reference to a bookseller as a 'benevolent Cheiron' though most of the ones I encounter seem to be more like an 'unkindly Charon' - ashen-faced men who glower at you across their pile of unsaleable books. As for the 'elixir of life' under the counter, if the bookseller is indeed a centaur isn't it likely to be a bag of oats?